Stuart Weitzman debuted an innovative retail concept designed by renowned architect Zaha Hadid with the opening of an international flagship store on the iconic Via Sant’Andrea in Milan, Italy. The 3,000-square-foot boutique has been unveiled on the 19th of September during an exclusive Milan Fashion Week event hosted by designer Stuart Weitzman and the iconic Kate Moss, who stars in the brand’s fall campaign. The six-window storefront located at Via Sant’Andrea, 10/A was chosen as the debut location for the new retail concept because of its reputation as one of the world’s premiere shopping destinations. Additional flagship stores designed by Zaha Hadid Architects are planned over the next few years and will be strategically located around the globe. 2014 openings are slated for Hong Kong, Rome and New York. As Stuart Weitzman is at the forefront of style and design, the selection of Zaha Hadid to develop these retail concept stores reinforces his vision and commitment to breaking new ground. The MAXXI: National Museum of 21st Century Arts in Rome, Italy and the London Aquatics Centre for the 2012 Olympic Games demonstrate the spatial sensibility of her work. 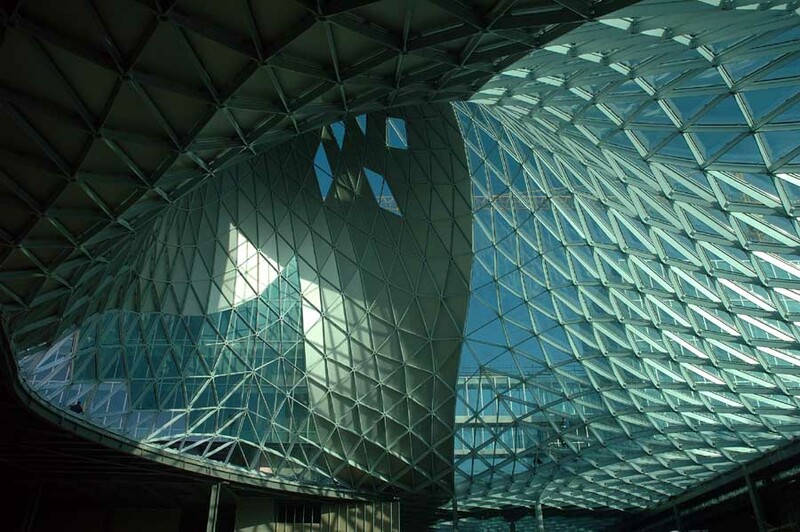 Further seminal buildings such as the Rosenthal Center for Contemporary Art in Cincinnati and the Guangzhou Opera House in China have also been hailed as architecture that transforms our idea of the future with innovative concepts and bold, visionary forms. The Milan flagship is fluid and playful. 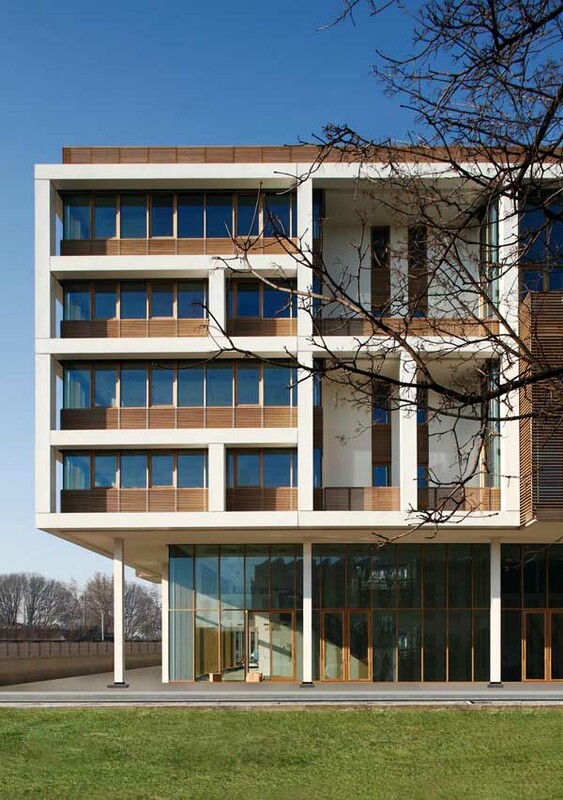 A dialogue of geometry and materiality creates an enchanting rhythm of folds and recesses further shaped by functional and ergonomic considerations. Modular display units showcase shoes and also provide seating, while a seamless integration of diverse forms invites our curiosity. The juxtaposition of these distinct elements of the design defines the different areas of the store. 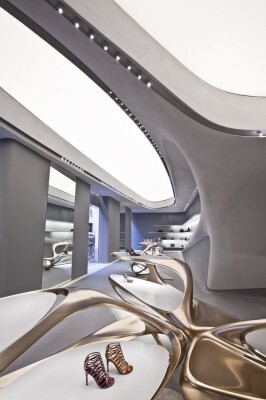 Rooted in a palette of subtle monochromatic shades, Hadid created an interior landscape of discovery centered on two separate zones to enhance the relationship between the customer and the collection. 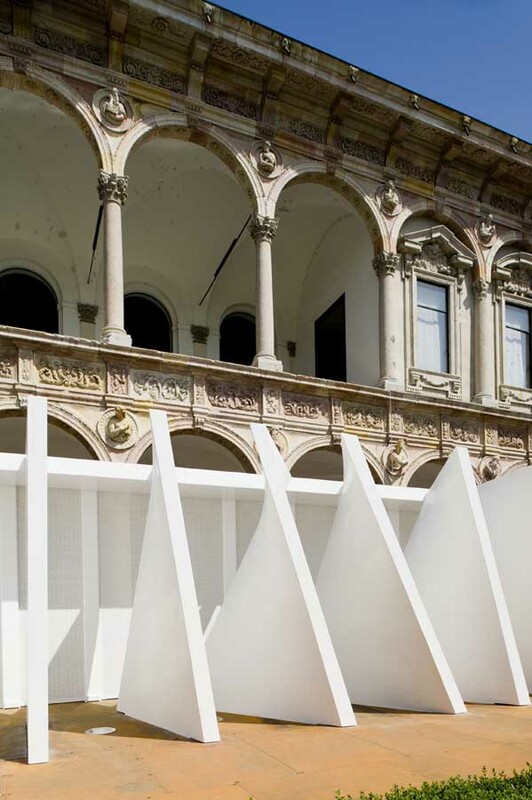 Experimentation with materials and construction technologies further define the unique space. The curved modular seating and freestanding display elements have been constructed from fiberglass dipped in rose gold – a technique similar to that used in boat manufacturing. Also, the glass-reinforced concrete (GRC) of the store’s walls and ceiling expresses solidity whilst at the same time the delicate precision of complex curvatures focus on areas for display. “The design is divided into invariant and adaptive elements to establish unique relationships within each worldwide location; yet also enable every store to be recognized as a Stuart Weitzman space,” explains Zaha Hadid. The opening of the Milan flagship boutique also marks the 100th Stuart Weitzman global retail store. This collaboration with Zaha Hadid Architects is a major component of the strategic global retail expansion of the Stuart Weitzman brand within the luxury sector. International growth includes an emphasis in Asia, especially Mainland China over next three years with additional stores planned for Korea, Taiwan, Asia, the Middle East, Australia, India and Philippines.